If you have a passion for driving, you’ll want to know more about Drive: Multiplier Mayhem, the new slot out now from NetEnt. Mind you, even if cars aren’t your thing, the potential prizes on offer here will make this slot well worth checking out. Don’t be put off by the lack of a bonus round, either – as you’ll soon discover, this slot game has much more to offer in the main game. The NetEnt Drive: Multiplier Mayhem slot is a 5 x 3 reel slot game that features 15 pay lines in total. It has wilds in play, as well as a scatter symbol, but the best part about this video slot is the multiplier feature. It may take a while to get the hang of how the multipliers work, but personally, I think it’s worth it. Read the pay table and have a go at the game to get a better understanding of it before you play Drive: Multiplier Mayhem for real money. 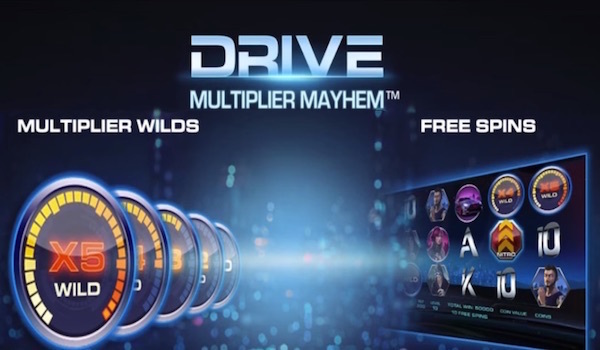 Drive: Multiplier Mayhem is one of the latest UK slots, so it’s early days regarding how it will be received by players. However, the graphics are superb. If you’ve tried some NetEnt games before, you’ll know the graphics are always pin-sharp. The reels spin in front of a blurred cityscape in the background, which adds up to a nice 3D effect. There is also a car speeding along in the bottom left corner, which adds to the mood of the game. It’s user-friendly too, offering an autoplay feature if you want to sit back and let the game spin without constantly clicking the mouse. Multiplier Wilds boost in play winnings by up to 5 x! One key feature is the addition of Multiplier Wilds. I think these will boost the chances that Drive: Multiplier Mayhem will become a top-played game as each one could be worth as much as 5x. By the way, you can find the game available to play in demo mode on many websites. It gives you a chance to get used to how the Multiplier Wilds work before you start betting for real money. Wilds can pop up anywhere on the reels and will grant a multiplier, as you’ll soon see. Nitro and Scatter symbols have their own features and perks, too. Four different drivers and a supercar can pop up, and each one is worth a specific amount when you trigger three or more on a pay line. Aside from those symbols, you also have the usual king, queen, jack, ace and 10 symbols. These pay less, and they’re all worth the same amounts, with three of each required on a pay line to unlock a win. The big perk here relates to the Multiplier Wilds, which can appear on all five reels. Each one has a multiplier value the same as the reel it appears on. So, a wild on the fifth reel is great, as it gives you a 5x multiplier for any prize-winning combination, it becomes a part of. Get a couple on the same pay line, and those two multipliers are – you guessed it – multiplied together. The game also offers a scatter symbol featuring three darkened figures. Get three of these on the middle three reels and you’ll win 10 free spins. 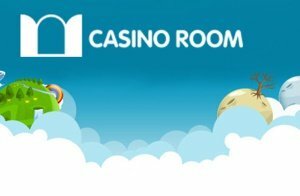 When you play the free spins round, watch for three Nitro symbols on the centre three reels. 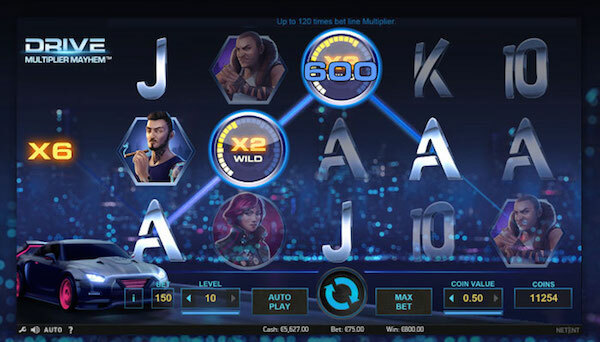 You’ll get more free spins and Multiplier Wilds overlaying the reels, too. Nitro symbols, when collected, can trigger races against the various opponents. This is the complex bit, and while illustrated in the pay table, nothing beats playing the game to see how it works. This slot is good in demo mode as you can figure out how everything works. 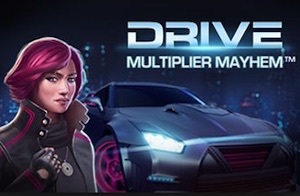 You’ll only win real prizes if you play Drive: Multiplier Mayhem for real money though. If you cover all the reels, you’ll bet 15p if you opt for the cheapest bet. If you have a bigger budget, it’s possible to wager as much as £75 on each spin. The RTP is gauged to be at the 96.7% mark at the moment. There have been plenty of new slot releases already this year. With that said, I think Drive: Multiplier Mayhem has more than enough to offer to be in contention as one of the best 2016 slot games we’ll see. It comes from a reliable software provider, and the multiplier feature makes it very different to many other games you’ll have seen and played. For my money, I think it’s definitely worth a shot, as standard prize amounts can easily be multiplied in this game.